Interpol. A name generally associated with international espionage, covert operations, and distant ports of call. 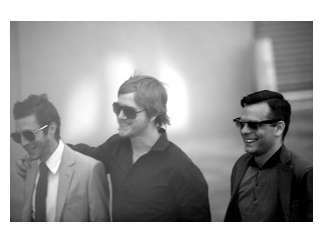 Yet since Interpol, the band, swept up listeners with their 2002 Matador debut 'Turn On The Bright Lights,' the moniker has gained new associations as well. It still carries global recognition. For some years now, one could hardly open a magazine, turn on a radio or television, or step into a nightclub, without hearing Interpol's dark, gripping songs or seeing their countenances. Despite this high level of media exposure, the quartet never lost the tension and complexity that won them acclaim worldwide.